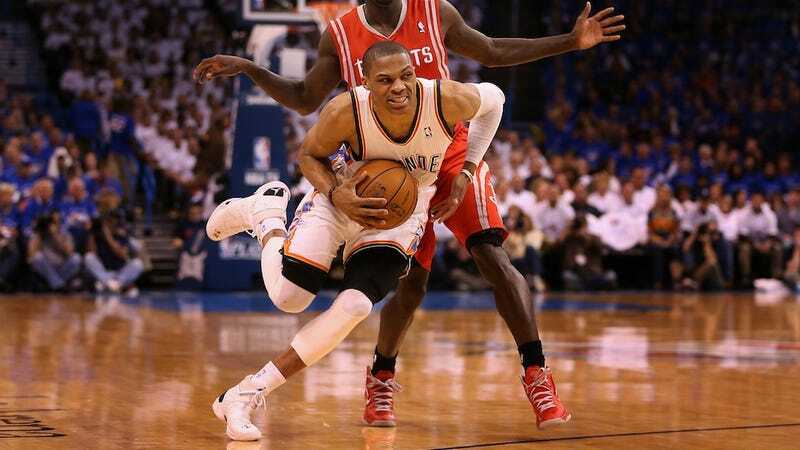 The Oklahoma City Thunder announced today that Russell Westbrook tore his meniscus in the second quarter of Game 2 against Houston on Wednesday and is out indefinitely. There's no timetable for his return yet, which potentially leaves the West wide open and sets up the Heat for an easy run to the title. But let's not be dramatic. CBS's Royce Young points out that Metta World Peace returned from a torn meniscus after just 13 days; recovery is more typically expected to be 6-8 weeks. That puts us in early June, which puts us in the finals. The Miami-San Antonio finals. Sigh.